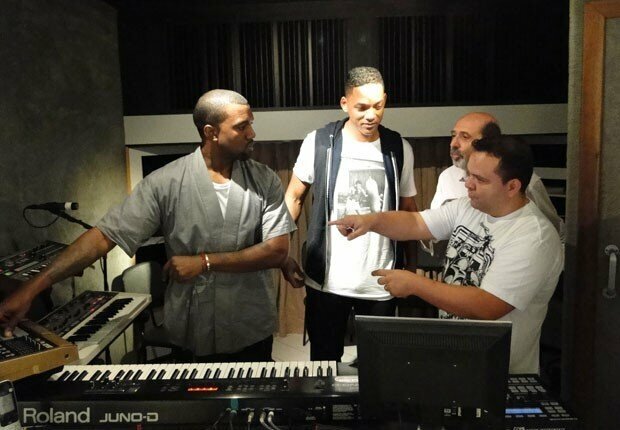 Kanye West and Will Smith have been spotted in the studio down in Brazil. Coming out over the weekend were a few pictures of Kanye West and Will Smith being spotted in the studio. I'm sure many of you are aware that Kanye wasn't at this year's Grammy Awards because he and Kim chose to opt out for a vacation down in Rio De Janeiro Brazil. Hell, do you blame them? Well making its way to the internet is a couple pictures of Hollywood star Will Smith also down in Brazil joining Ye' in the studio. By the look of things, it looks that the two are cooking up some new material. Now nothing official has been stated about a possible collab, but why else would the Fresh Prince be spotted down there? Time can only tell what will come from this, but it sure does make for some wishful thinking. Kid Cudi Announces Release Date For "INDICUD"